Silver and gold prices closed slightly lower Tuesday, but each advanced in July. Silver was the monthly winner among precious metals as it surged 1.1%. Palladium pulled in second at 1.0% while gold finished third with its 0.6% increase. Platinum was an outlier with a loss of 2.4% in July. Falling from a six-week high and snapping a four-day winning streak, gold prices for December delivery declined $9.40, or 0.6%, to $1,614.60 an ounce. Gold prices ranged from an intraday low of $1,614.20 to a high of $1,631.60. Losses on Tuesday were attributed to profit-taking and rising doubts that the Fed will engage in another round of easing. "If the market is disappointed at no further easing by the Fed at the next meeting we could see an abrupt but likely brief selloff," said James Steel, analyst, HSBC, according to Kitco News. "Any decline would be short-lived we believe, as investors may simply switch expectations for easing to later in the year, which likely help buoy gold prices. In the near term gold is more likely to track macroeconomic developments such as the FOMC meeting than physical indicators." The Federal Reserve’s latest monetary-policy decisions will be announced Wednesday after the conclusion of FOMC’s two-day meeting. Silver prices for September delivery shed 11.9 cents, or 0.4%, to $27.914 an ounce. Silver traded between $27.865 and $28.335. Platinum prices for October delivery settled at $1,416.90 an ounce, gaining $5.10 or 0.4%. The metal moved from an intraday low of $1,413.90 to a high of $1,434.60. Palladium for September delivery added $2.20, or 0.4%, to $590.55 an ounce, trading between $586.70 and $594.10. For the year so far, gold is the best-performing precious metal with its 3.1% increase. Silver is near flat with a one-tenth of a cent loss. In PGM metals, platinum has gained 0.9% but palladium has fallen 10.0%. For July in London, precious metal increases include 1.5% for gold, 4.1% for silver and 2.2% for palladium. Standing by itself, platinum dipped 0.1%. Sales of U.S. Mint bullion coins were unchanged on the day but finalized figures for July were not offered, suggesting a possible tweaking to the numbers late Tuesday or early Wednesday. Below are the most recent daily, July and year-to-date sales totals for U.S. Mint bullion coins. 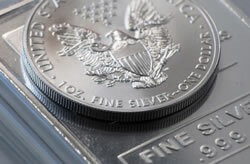 Above U.S. Mint bullion coin sales are in coin totals, not the amount of ounces sold.